The latissimus dorsi muscle is a large, triangularly shaped back muscle that helps you do things like pull-ups, swimming and even breathing. They function to stabilize your back while extending your shoulders. The lats are superficially located, which means they are clearly visible (when the skin is removed). To state it another way, you don't have to dissect away layers of muscles to locate the lats. And lucky for we non-medical personnel, (when we look at people with well-developed back muscles in particular) you don't absolutely have to remove the skin to notice the lats; instead, you can identify this important back muscle by its shape. The latissimus dorsi muscle is often called the "lats" or the latissimus for short. In general, although not always, each end of a muscle attaches to the bone. These places of attachment are known as the origin and insertion of a muscle. When it comes to the lats, the origin is complicated, but the insertion is simple. 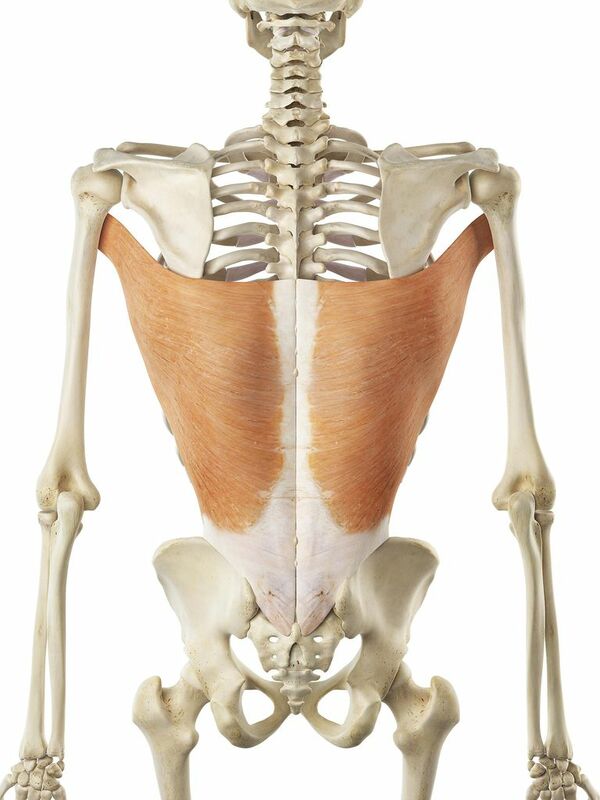 At the top, the lats muscle originates from the bottom six thoracic vertebrae and the last three or four ribs. Part of the origin also includes the thoracolumbar fascia at the level of the lumbar and sacral vertebrae, as well as the back one-third of the outside part of the top of your hip bone. And finally, the origin of the lats includes just a tiny little bit of the bottom angle of your shoulder blade. As the muscle fibers of the lats extend from the origin to the insertion point (the insertion for the lats is located on the inner aspect of your upper arm bone, just below the shoulder joint) they taper into a point. This wide origin into a pinpointed insertion forms of the muscle, a triangular-like shape. The latissimus dorsi muscle is innervated by the long scapular nerve, also known as the thoracodorsal nerve. Strong "lats" help you use your arms to pull your body weight up. Good examples of activities that use the lats extensively include doing chin-ups, rock climbing, and swimming. The lats also assist with the breathing process. They are called an "accessory breathing muscle," which means they enhance the movements of the trunk during inhalation and exhalation. They do this by lifting (expanding) the circumference of the rib cage when you inhale, which may increase the volume of air that enters your lungs. During exhalation, the latissimus dorsi muscle helps decrease the circumference of the trunk, which may have the effect of squeezing more air out. With your trunk stationary, the lats turn your arm in, they bring it closer to the midline of your body and they extend your shoulder joint back (essentially the same as bringing your arm back). They can do these movements separately or in combination with one another. Other things the latissimus dorsi does is to bring the whole shoulder girdle down (called depression), as well as assist in the act of side bending (called lateral flexion). When both lats are working at the same time they assist with arching the spine (called hyperextension) and with tilting the pelvis anteriorly. If you have scoliosis (C curve in your spine), one side of your lats muscle will likely be tighter than the other. If you have a kyphosis, the front part of your lats will likely be tight. Injury to the thoracodorsal nerve, which arises from cervical level six, seven, and eight may result in weakness or paralysis of the latissimus muscles. If you have an injury to your lats, you should see your doctor right away. He or she can diagnose the problem and get you started on treatment. Treatment and rehab for a latissimus problem will vary depending on the problem. Most often, working with a physical therapist can help you regain full lat function. Your latissimus exercise program should be tailored to your needs. Working with a professional can ensure you do the right things, at the right time, to get back to full function quickly. Latissimus Dorsi. GP Notebook website.